Haven't had a chance to see the interview or read the reviews properly. What struck me is the absolute hypocrisy of these American states that want to ban shariah law. They reduce shariah to a series of harsh punishments which are not the sum total of shariah. This is all about politics and playing on the fear of extremist Islam. The observation that these states where the extreme shariah punishments are applied are associated with political turmoil has its echoes in the US. Most if not all of the states imposing these shariah bans execute people for murder. Every one of these states has executed innocent people. There are countless examples of wrong convictions and denied appeals where politically motivated governors have authorised the judical murder of an innocent human being solely because it promotes their image of being tough on crime. http://www.deathpenaltyinfo.org/innocence-and-death-penalty in fact there are several US presidents who have sent men to execution to bolster their tough on crime credentials during their run up campaign for the presidency. I can't argue with that. This is of course politically expedient right now in the US. The author had to think for a minute to find polite words to talk about the efforts to band Shariah in some of the states here in the US. It is a shame that Pakistan's name came up on this matter. Most of the legal system in Pakistan, as far as I understand it, is British based. 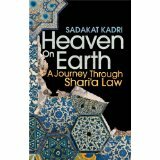 However, some of the "Shariah" elements have been brought in - and unfortunately - they are some of the most controversial and problematic. Why fixate on punishments? What about and emphasis on social justice and equality issues?